I don't know about you, but the Fall is crazy for me. I am still dreaming about our trip to Hawaii last summer. As a mom of four who also likes to stay involved in school, church, and the community, I am constantly trying to find ways to make my life a tiny bit easier or less stressful, especially around Halloween and other holidays. Unfortunately I can't take a tropical vacation, so I have to find ways to de-stress and stay sane during the chaos. 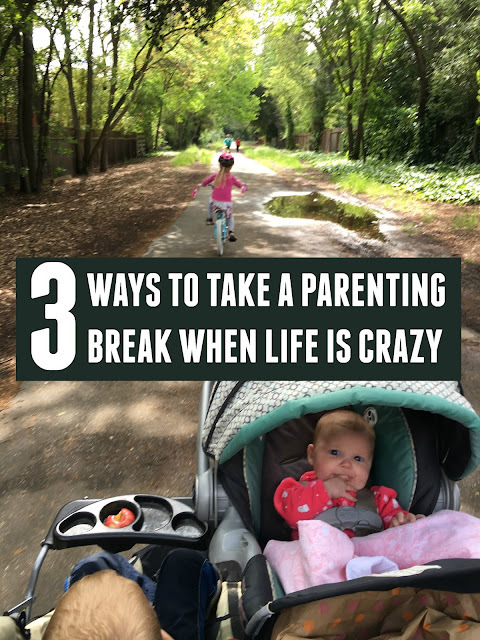 Today I'm sharing three ways I take parenting breaks, even when my weeks are busy or stressful. These are tips that I use regularly and they totally keep me sane! This post is sponsored by Chuck E. Cheese's. You're probably thinking... that is a crazy idea. You would think that inviting extra kids over would cause more stress. It is the opposite for me. When each of my big kids has a friend over it is actually a break for me. My kids are ages 8, 5, 3, and 9 months. My 8 year old is great at entertaining himself. My 5 and 3 year old sometimes play well together and sometimes fight. When we invite friends over the dynamic in the house shifts and everyone is nicer and more patient (including me). Often all three of my big kids will each have a friend over and they run off and play together and I am left with the baby. Sometimes the baby will be so entertained by the new friends that I can stay nearby and catch up on dishes or emails. Often the baby will be napping while my big kids have playdates and I am left twiddling my thumbs trying to decide how to spend my free time. I never would've thought that having a house full of friends over would be so relaxing! There are obviously moments of chaos (like when everyone is hungry at the same time), but for the most part they are a lot of fun! Playdates are beneficial because they help kids make deeper connections with other kids. You also get to see how your child interacts with other kids when they are at your house and you get to know their friends. Often kids will play with the same few familiar friends on the playground at school again and again. Once they get to know others kids through playdates, they are often more inclusive and willing to include their new friends in their play. Don't get me wrong, playdates require some effort. You need to be thoughtful about the friends you invite over and set boundaries with your kids. You also may need to jump in and help with an occasional argument too. Having extra kids is always more of a break for me though than having just my own kids! What works for you? Read more about how to set up successful playdates HERE. I am not kidding. This is my favorite thing. When my husband is out of town for a week and things are busy, I pack everyone up right after school lets out and we head to a local kids play place that has free Wi-Fi. 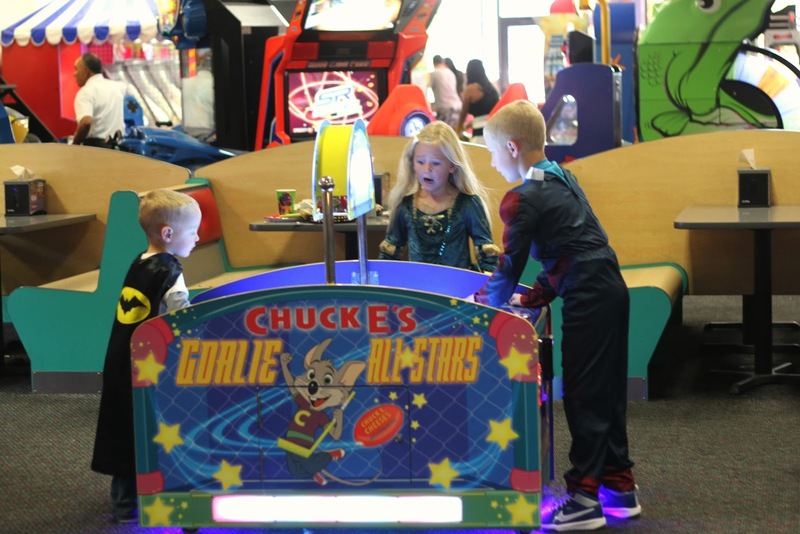 Chuck E. Cheese's is one of our favorite spots because they have games, food, and free Wi-Fi. As a working mom I always have a ton of work I could be doing. If I can do something fun for my kids, feed them, and also find a few minutes to be productive and get some work done, I feel amazing. A few weeks ago I had the chance to go to Texas to the Chuck E. Cheese's headquarters to try out some food, play games, and chat about how they are making Chuck E. Cheese's even more awesome for parents and kids. I left my big kids with friends and my husband and 9-month-old tagged along. It was a nice little break. 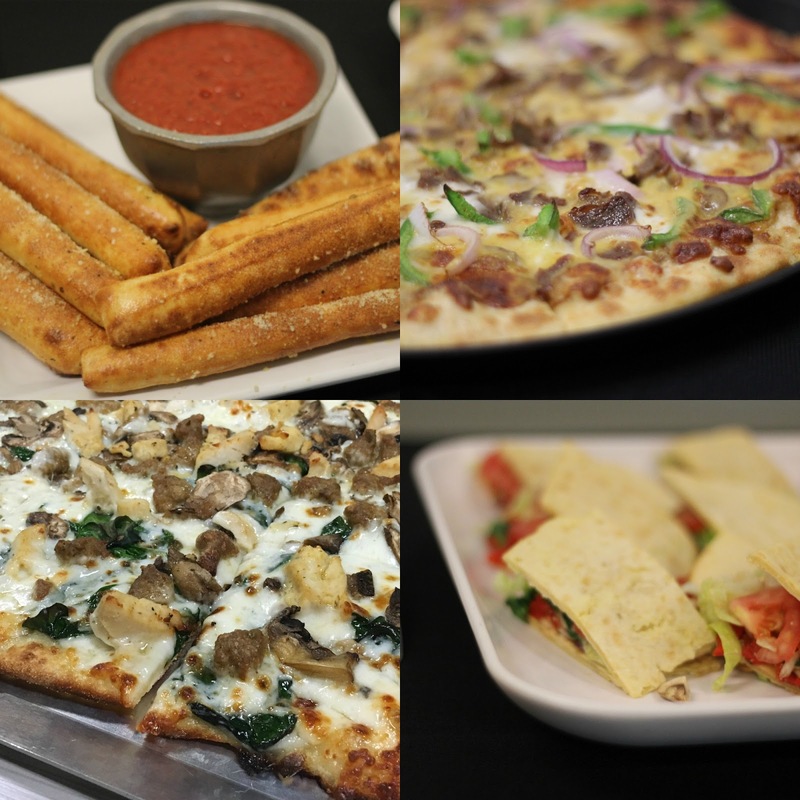 I also got to try out some new low-calorie flatbread sandwiches that they are testing in a few markets. On my trip to Texas I also learned about several fun CEC promotions that are happening now or coming soon. You can read all about them HERE. 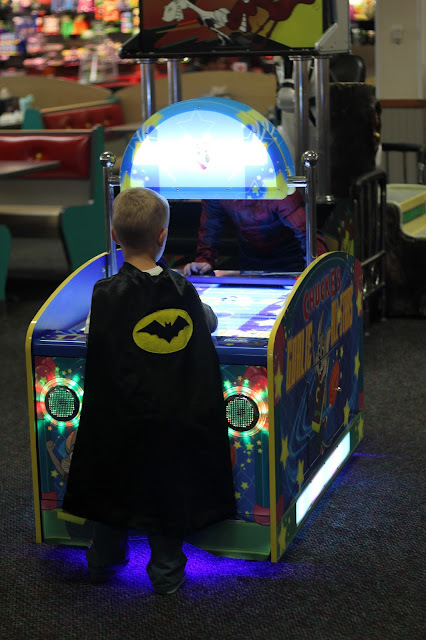 Last week my kids wore their Halloween costumes when we went to Chuck E. Cheese's and they each got 50 free tickets! Not only did I get a break for an hour or two but the kids thought I was the coolest because I helped them get free tickets. Even the baby got in on the fun. 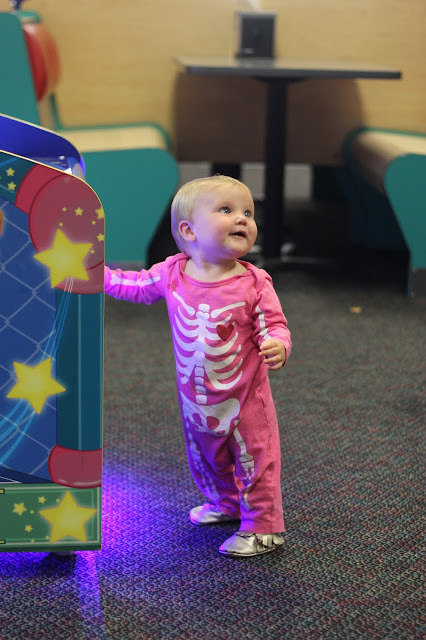 Chuck E. Cheese's is one of our new sponsors, so I'll be sharing more from them over the next year, including some new things that are happening. I'm especially excited about the new Play Pass (that is used in lieu of tokens). Not having to keep track of tokens will also give me a break! Ha! 3. Take a parent "time out." I would love to jet off to the spa or hop on a plane for some R&R with my husband when I am feeling burned out as a parent, but that is rarely possible. Life with four kids is busy and chaotic, but I've learned that if I can take a little "time out" for myself during the day I am a much nicer and happier mom. Sometimes that means that while the baby is napping my big kids get to watch a movie and I scroll through my Instagram feed. Often my "time out" involves doing dishes or folding laundry while listening to a podcast or favorite song. Although my parent "time out" rarely means that I am doing nothing and just sitting in a bubble bath, it is a mental break from being a parent for a few minutes. Sometimes the baby won't nap and my big kids won't watch a show, so I will put in headphones and listening to relaxing music amidst the chaos. Often we'll head outside for a walk or to hunt bugs or ride bikes and although I am present I might check out for a few minutes and listen to a book on tape while pushing my jogging stroller around the neighborhood. Taking time within the chaos of our days keeps me the most sane. 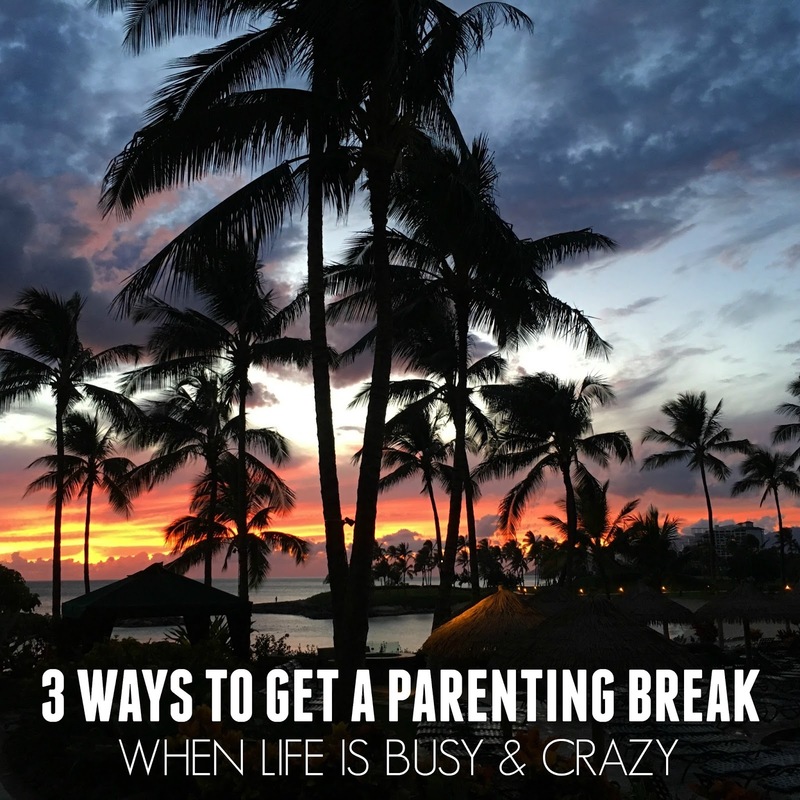 Do you have any additional ways that you get a parenting break when life gets busy? Disclosure: This is a sponsored conversation written by me on behalf of Chuck E. Cheese's. I am a #ChuckEChampions Brand Ambassador for 2016-2017. The opinions and text are all mine.